Immediately upon hearing of the defeat at Thermopylae, Sparta and her Peloponnesian allies began building a wall across the Isthmus of Corinth. The first step was to block the Scironian Way, an important road connecting Megara to Corinth. Then the wall itself was started – 3.6 miles long. Herodotus tells us the wall was mostly complete as the Battle of Salamis approached. The Greek commander, Themistocles, concerned that the Peloponnesian Navy would not fight, removed their chance of escape by conning the Persians. He sent a false message to the Persian commander declaring that he was disloyal and letting them know that the Greek Navy was about to withdraw. He suggested that if the Persians attacked quickly they could destroy the Greeks. The Persians believed the story and immediately sent their fleet into the Saronic Sea near Athens. The Spartans, trapped by the blockade, were forced to fight along side the rest of the Greek Navy. The result was a great victory and the end of the Persian advance into Southern Greece. After the Battle of Salamis, the Athenians came to Sparta to ask the Spartans to join in a military campaign to drive the Persians out of Attica. The Ephors took a several days deciding what to do. Herodotus speculates they wanted to make sure the wall across the Isthmus was complete before proceeding, because they suspected the Athenians would surrender to the Persians if the opportunity arose. The Ephors finally consented and sent a full contingent of five thousand Spartan warriors and thirty five thousand Helots. 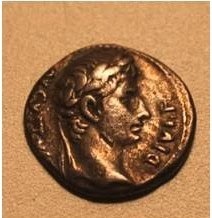 This army, along with the rest of the Greeks, went on to win the Battle of Platea. I have not been able to find a second source describing the construction of this Peloponnesian Wall and specifically where it was located. 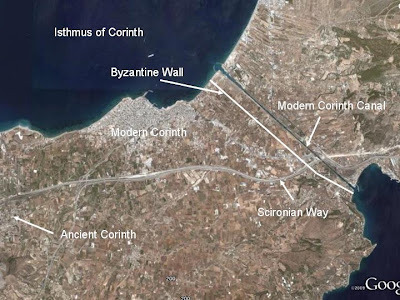 Later, 450 A.D, a Byzantine Wall was built across the Isthmus. There are excavated ruins for this later wall.